If you love high-quality, casual dining like we do, listen up. When zpizza, the first chef-inspired pizza chain, approached us to experience its newest creations that were being considered as future menu offerings by receiving a dinner kit delivery… we were intrigued. A dinner party with pizza’s and salads? It reminded me of how people used to entertain casually post-game, after-theatre and late night pot-luck gatherings. 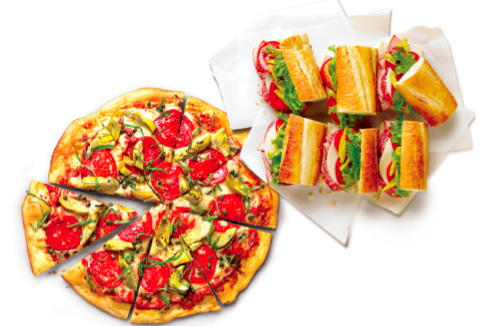 Sometimes the simplest fare is the best fare and we learned that with zpizza and our eight thought-leader guests who were part of the branding experiment. These new dishes zpizza offered in their Pop-Up Dinner kits serves up to eight people, featuring a Mediterranean Plate, Avocado Arugula Salad, four mouth-watering gourmet pizzas like Provence, Thai Chicken, Napoli and Casablanca, just to name a few, were beyond tasty. The gluten-free crusts made the dough taste more like a gourmet pretzel, a good thing, than any regular flour crust that most fast casual Italian dining places serve these days. zpizza’s non-GMO wheat flour, prepared fresh every day, hand-thrown and fire-baked until uniquely crisp, is so unique it should have a patent based on its superior taste, too. I came to learn that zpizza is known for its high-quality and fresh ingredients and was founded in the creative colony of Laguna Beach, California, where the area’s craftsmanship has flourished for almost a century. So it comes as no surprise that the critically-acclaimed pizza is a true Laguna original. Their aim for quality continues when the toppings go on, combining select ingredients using award-winning skim mozzarella from Wisconsin, certified organic tomato sauce, MSG-free pepperoni, additive-free sausage, and fresh produce. Their gourmet salads and sandwiches are just as delicious. We dove into the Arugula and Pear & Gargonzola salads it tasted like that of what a fine dining establishment would serve as a first course. Locations are all across the country in 16 states (so far) and zpizza’s Austin, Texas store location was our destination in Circle C and we plan to return time and time again with Carl, the location’s manager, deftly handling the crowd demanding their zpizza cuisine.